Moderator Mark Bisnow has been a lawyer, politico, and businessman in Washington for nearly three decades and publishes a growing series of electronic newsletters, including Real Estate Weekly, which features interviews with top Washington- area experts. 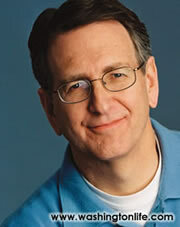 He also writes“BizKnow,” a weekly personality column in the Washington Business Journal. With more than 25 years in sales, over a decade as a “Top Producer” in Northern Virginia, and Re/Max’s “Number One Agent Worldwide” for five consecutive years. 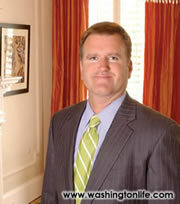 Casey Margenau uses his wealth of experience to ensure the financial success of his clients. His professionalism and attention to detail have led him to the very top of his field. Jim Bell recently joined Sotheby’s Washington Fine Properties and specializes in the sale of Washington, D.C., properties—primarily in the Kalorama, Georgetown, Dupont Circle and greater Northwest neighborhoods. 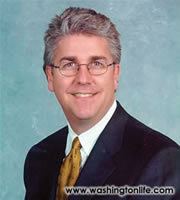 With real estate sales of over $100 million, Jim has been a consistent sales leader. Jane Fairweather has been named the“Number One Coldwell Banker” agent in the Washington Metropolitan Area for the last six years and has consistently ranked among the top ten Coldwell Banker agents in the nation since 1998. In 2004, she made $100 million in sales, primarily in Bethesda, Potomac and Chevy Chase, Maryland. Mark Bisnow: Which region is the hottest: Northern Virginia, Maryland or Washington? Casey Margeneau: I guess it depends on what price range you’re talking about and what type of product. I don’t know what’s going on in Maryland or Washington as much as I know the nuances of my marketplace in Virginia, which is doing very well, but we’re loaded with inventory. There is great supply and demand, but demand is cautious because most of the inventory is priced a little too high. MB: And why is that? CM: Because of the natural way the market works. As the market gets hot, people raise their prices. We have raised them beyond the level of reality, so now the market is correcting and prices are coming back in line. Right now we have more inventory than demand. Jim Bell: In D.C., every price range is selling well. But the higher the price range, the better the value of property. MB: At what price do you start to see good values? JB: Anything above $2 million. MB: I thought the economy in Virginia came roaring back after 2001. Maybe there are less internet companies than before, but there are always government contractors. Why isn’t there a ton of money sloshing around to buy a $2 million- plus home? JB: Five years ago a $2 million home did not sell at all. The fact that we are selling $2 million homes like they were $500,000 and $600,000 dollar homes eight or nine years ago is phenomenal. There are a lot of sales. The opposite could be asked: how do we have so many people who can afford expensive homes and so fast? 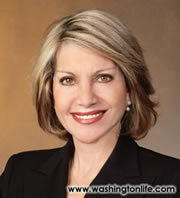 Jane Fairweather: In our market in Maryland, a “move-up” home is probably $1 million to $1.6 million. That’s not an upper-bracket luxury home. A glamorous home, in a glamorous neighborhood will cost you at least $2 million. MB: What neighborhoods are you talking about? MB: How much less house do you get close-in versus further away in Potomac? Suppose you had $2 or $3 million dollars. What is the difference between Potomac and Chevy Chase? JF: The first thing you give up is land. When you’re out in Potomac, you get two to three acres, three-car garages and nine bedrooms with 9,000 to12,000 square feet. Closer into the city you’ll probably get 5,000 square feet for pretty much the same price as what you sold your house for in Potomac. JF: No, but there are a lot of empty-nesters whose children have grown up and who are looking to move out of the suburbs. There are 78 million baby boomers in the U.S. and the first wave, the Vietnam generation, are in their fifties. They are asking themselves, “Why do I need to live in the suburbs? I’d like to be where the action is.” The action is in all the downtown locations. It is what spurred the development of high-end stuff in Friendship Heights and it is causing developers to build town centers in suburban locations. MB: But, are there people taking the place of the generation that’s leaving Potomac? JF : There are plenty of people who still want a big house. JB: With the baby boomers you also have an architectural element—they prefer large apartment buildings downtown or Logan Circle to townhouses unless they have an elevator. They’re looking forward 10 to 15 years in their lives. They are also interested in getting second homes and they typically want those to be one-level too. MB: Are you seeing greater interest in living closer because of higher energy/gasoline costs? JB: They would rather not commute because of time, not necessarily because of higher prices of gasoline. JF: In the price range we deal with, gasoline is not an issue. We are talking about the middleto- upper end of the market. When you are time-pressed, the time you spend in your car commuting back and forth is time you miss living your life. MB: But for years there has been terrible congestion. Is it that much worse now, that people are changing their ways? JF: No, what I think you have is this emergence of baby boomers. MB: What about families who have young children? Do they want to be in D.C.? MB: Why don’t they want to move to green spaces? JB: Quality of life. Their friendships are here. The parks have been renovated. The stores are here. The core of everything you used to go to the suburbs for is now in the city. It is not a Washington phenomenon. You see it in all the urban centers along the East Coast and Chicago. People are in the urban areas. CM: It is always interesting to see how the market has changed. People moved out into big lots at one point, now they want to move to tiny lots. Recently I went to an Economics Summit, where I learned that, seven years from now, we will be 480,000 units [short on] inventory. We have 80,000 new jobs in Northern Virginia alone right now. There is always a group of people moving in and moving out of Washington. Fairfax County has the highest per capita income in the country and we’re about seventh or eighth in housing prices—not so bad. The housing is expensive but it is affordable in comparison to incomes. JF: I think something else contributed to the downtown Washington phenomenon. Typically, young people rented. But with low interest rates they were suddenly able to buy. Instead of putting up rental buildings, developers are putting up condos. That makes a stable neighborhood and the retail follows because you have owners who are not moving every two years. JB: If you think about it, an entry-level associate at a law firm is making six figures. A new class comes in every September who can afford a $450,000 property no money down. And that is a nice condominium for anywhere you want to buy—Bethesda, Arlington, downtown Washington. But it is the income group that we are dealing with in Washington, inside the Beltway. The incomes are driving the amenities, type of housing being built and the quality of life that is being established here. And yes, [Mayor] Tony Williams has helped immensely, but it is just beyond that. It is a shift in population. The population shifted outside the city in the 1960’s and now they are coming back. CM: In [Northern Virginia], the condominium market has just died. Until recently, condominiums had a phenomenal investment. Normally we would have 800 condominiums on the market in Arlington and Alexandria. Currently we have 1,800 to 2,000 condominiums on the market. None of them are selling. We have over 60 percent ownership by investors. JF: It’s a totally different market than Chevy Chase. CM: North Arlington is doing fine because you have the urban center, but still they are not selling as well as they have been. JB: Well, boundaries create value. JF: Because there is a limited supply. There is only so much land for building in downtown Bethesda. For every unit that is for sale, I have 30 buyers! They are lined up because there are no units. If you suddenly put 30 units on the market for every one buyer, soon there will be no demand. MB: But the story about Reston does not worry you? Reston is not that far beyond McLean. You could have North Bethesda or Rockville suddenly creating luxurious new developments. JF: They are! They are developed In downtown Bethesda, no builder will be come into that market and be able to build for less than 800 dollars per square foot and if you are going to get prices like that, you have to offer a downtown living experience, not suburban projects. An y developer that comes into town to do suburban condominiums might as well declare bankruptcy before he digs a hole because it’s not going to sell. Create your downtown first and then your buyers will follow. CM: I have no concern about the single family houses and luxury homes. The upper end of the market is doing extremely well, so if you’re in Fairfax County in a $1million plus home, you have made a very safe investment. I’m scared of investing in these subdivisions that developers are building in Loudon County and Prince Georges County where houses are being sold for $1.5 million. We have done too much with the condominium market, the biggest problem is that they were bought by investors and now we have nine condos a week coming on the market with no sales. All of these investors paid $250,000 to $350,000 dollars for a condo and now they are trying to make $200,000, with no added value. JB: Absolutely. You have to hold it for two years and, affidavit after affidavit, you have to say you are an owner occupant. They will not let investors buy. MB: What if interest rates spike up? JB: I have been in the banking business before as head of First Union’s Morris Division in Washington. I started when interest rates were 14 to 16 percent for adjustable mortgages, so a good interest rate is 8 percent for me. At this level, you look at the debt ratio of the people in this market and they do not carry debt. If they have debt at all, it’s student loans. CM: The Virginia market is the same we are not dealing with very much debt. We are dealing with move-up buyers. They have at least 500,000 dollars equity in their property. They are not overextending on their purchase. Interest rates are a short term factor because anytime there is indecision in the market, people make short term decisions to hold off, which has been happening since April of this year. There has been so much talk about the bubble but this is a shortterm slow down in the market and it is actually healthy for prices to come in-line, and gets us out of the crazy bidding wars, allowing the market to breath so that it can move forward again . JF: In my market, interest rates will not matter. I’m talking about people who are downsizing and expecting to live there for 20 years or looking to buy a move up house. Fall markets always have fewer buyers and more sellers..
JB: I agree to a certain extent. I do not think they are desperate, but if they do not make a deal now, there are six other people right behind who will. MB: Predictions for a year from now? Are we going to be sitting here talking about another 20 percent appreciation? JB: I think there’s going to be a healthy seven to ten percent growth. There is a strong, healthy market here, and you have a lot of well qualified buyers who have a lot of cash. MB: You do not think it is going to stop? JB: It has stopped in other markets already. People forget what happened after September 11? You couldn’t give away an $800,000 house in Washington D.C. for a year. Take Columbia Heights for example. You have a lot of people who bought $350,000 condos and wanted to sell them for $450,000, but you can buy a house for $355,000. It makes no sense. That is a clear example of a housing imbalance. Where you have good housing stock at a fair market price, you will have willing buyers. That is what makes this market very healthy. MB: What is the price per-square-foot in your various markets? JB: The price per square foot in Georgetown is $753 but a luxury condominium in Georgetown is about $1,000. In Kalorama, it is around the $650 to $700 market, and depending on renovation it can go as high as $750. Georgetown is about 20 to 25 percent more expensive than Kalorama. Logan Circle is comparable to Georgetown and Kalorama. The condo price per square foot could be as high as $700 to $900, and Capitol Hill is getting up there, too. CM: I have a different market them what is going on downtown. I don’t see that much appreciation next year, maybe four to six percent. There is a possibility that we might get a bump because of the construction costs, because of Katrina. I also believe that the big builders are going to divert resources. Right now they artificially keep up their supply and demand by only allowing so many houses to be sold per month because they don’t want to get too far out and they don’t have the production capacity to build any more. Because the developers are national, houses are built in factories, and are shipped and assembled on site. I think they are going to take some of that capacity away from those projects and use that to deal with Katrina rebuilding. The effect may be a bigger housing shortage, but I also see that there is an affordability problem. When our average price of a home is over $550,000 and the mean is over $600,000 in Fairfax County, some people find it very difficult to afford housing. Even though I work on the luxury end of the market place, it still all trickles up. Long term, we’re going to go up. Short term, I don’t know if we’re going to have as great as an appreciation as we have had over the past few years. MB: And what about square footage? CM: We’re at $250 to $300 a square foot for houses and $500 per square foot for luxury homes. That is construction price, not including land. The lots are going anywhere from $500,000 on the low end to over $1 million. JF: My market is different because we operate in scarcity of single family homes. Chevy Chase has a building moratorium that is going to further tighten the supply. Builders are not going to want to go in there and take the risk of knocking a house down and putting up a big house. The few houses that do come on in the market are going to continue to appreciate because there is no place to go. In the last three years, the price per square foot for land has gone from $315 to $750 to $800 in prime locations. If you want to buy something in Edgemoore you are at $2 million, and that’s a tear down. In terms of the condo market, unlike Northern Virginia, we are under built to an extreme. The Adagio, in downtown Bethesda, came on the market with 90 units and sold out in two weeks with a waiting list of 3,000 people. According to the last Census report baby boomers represent 52 percent of our market in the Washington metropolitan area. The last baby boomer will turn 55 in 2020. What do boomers want to buy? They want to buy downtown locations, water properties, golf communities—any kind of a second home market. Follow the boomer and you will make money.